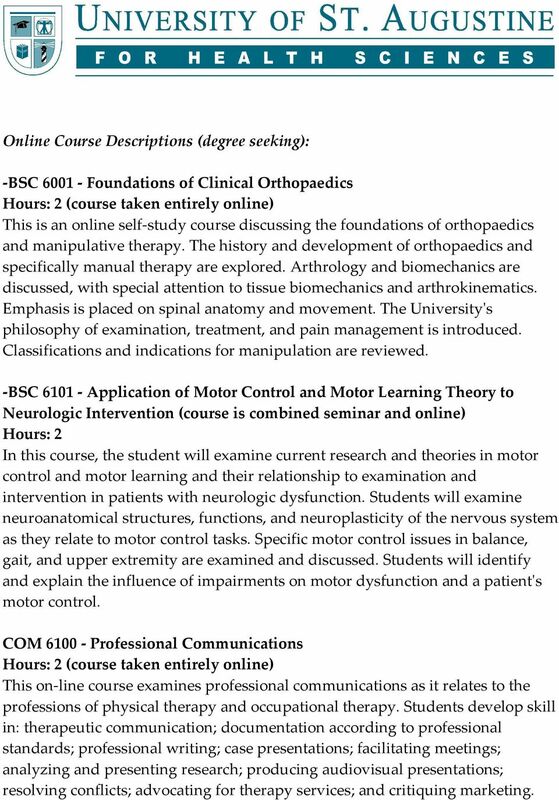 Download "Online Course Descriptions (degree seeking):"
1 Online Course Descriptions (degree seeking): BSC 6001 Foundations of Clinical Orthopaedics This is an online self study course discussing the foundations of orthopaedics and manipulative therapy. The history and development of orthopaedics and specifically manual therapy are explored. Arthrology and biomechanics are discussed, with special attention to tissue biomechanics and arthrokinematics. Emphasis is placed on spinal anatomy and movement. The Universityʹs philosophy of examination, treatment, and pain management is introduced. Classifications and indications for manipulation are reviewed. BSC 6101 Application of Motor Control and Motor Learning Theory to Neurologic Intervention (course is combined seminar and online) Hours: 2 In this course, the student will examine current research and theories in motor control and motor learning and their relationship to examination and intervention in patients with neurologic dysfunction. Students will examine neuroanatomical structures, functions, and neuroplasticity of the nervous system as they relate to motor control tasks. Specific motor control issues in balance, gait, and upper extremity are examined and discussed. Students will identify and explain the influence of impairments on motor dysfunction and a patientʹs motor control. COM 6100 Professional Communications This on line course examines professional communications as it relates to the professions of physical therapy and occupational therapy. Students develop skill in: therapeutic communication; documentation according to professional standards; professional writing; case presentations; facilitating meetings; analyzing and presenting research; producing audiovisual presentations; resolving conflicts; advocating for therapy services; and critiquing marketing. 2 HSA 6101 Health Service Administration Hours: 3 (course taken entirely online) This online course examines the functions of a rehabilitation manager. Content includes staff resource management, strategic planning, marketing, and fiscal resources management. Emphasis is placed on decision making, change implementation, and quality control processes in health care organizations. Students have the opportunity to analyze problems and develop strategies for change in a variety of hypothetical rehabilitation settings. 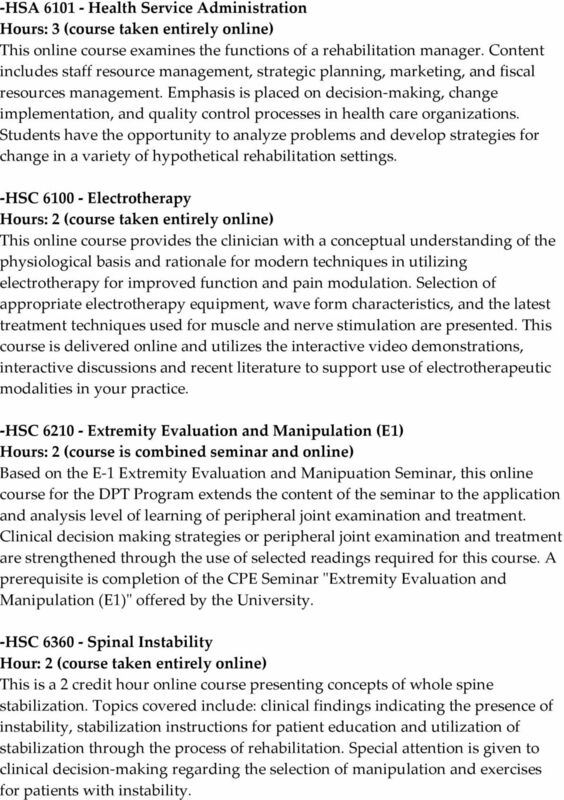 HSC 6100 Electrotherapy This online course provides the clinician with a conceptual understanding of the physiological basis and rationale for modern techniques in utilizing electrotherapy for improved function and pain modulation. Selection of appropriate electrotherapy equipment, wave form characteristics, and the latest treatment techniques used for muscle and nerve stimulation are presented. This course is delivered online and utilizes the interactive video demonstrations, interactive discussions and recent literature to support use of electrotherapeutic modalities in your practice. HSC 6210 Extremity Evaluation and Manipulation (E1) Based on the E 1 Extremity Evaluation and Manipuation Seminar, this online course for the DPT Program extends the content of the seminar to the application and analysis level of learning of peripheral joint examination and treatment. Clinical decision making strategies or peripheral joint examination and treatment are strengthened through the use of selected readings required for this course. 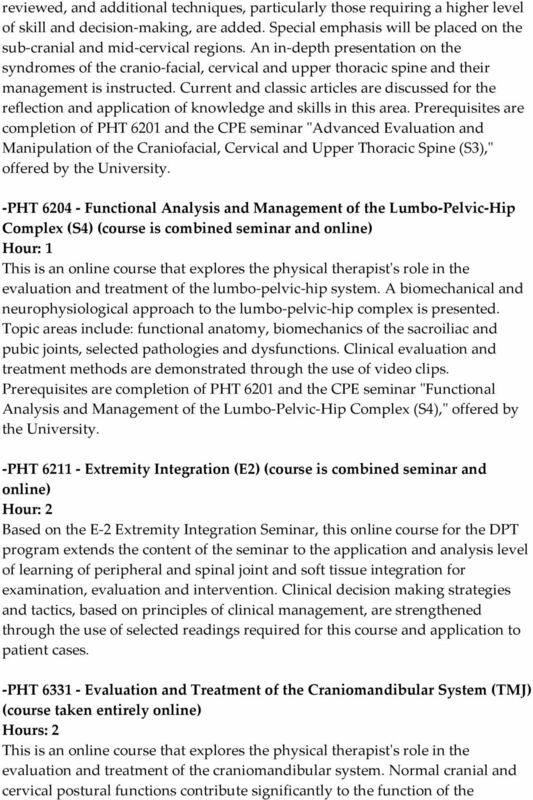 A prerequisite is completion of the CPE Seminar ʺExtremity Evaluation and Manipulation (E1)ʺ offered by the University. 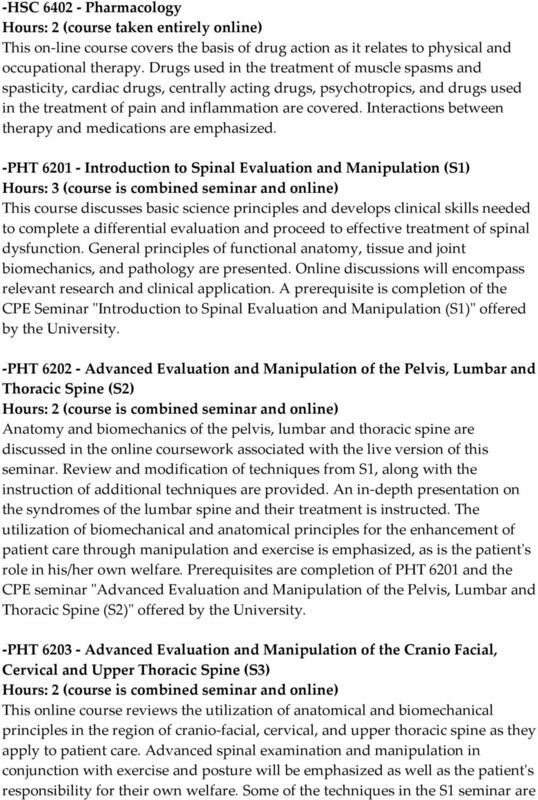 HSC 6360 Spinal Instability Hour: 2 (course taken entirely online) This is a 2 credit hour online course presenting concepts of whole spine stabilization. Topics covered include: clinical findings indicating the presence of instability, stabilization instructions for patient education and utilization of stabilization through the process of rehabilitation. Special attention is given to clinical decision making regarding the selection of manipulation and exercises for patients with instability. 5 temporomandibular articulations and to dental occlusal contacts. The emphasis of the course is on the relationships of these various components of the craniomandibular system and their related impairments. 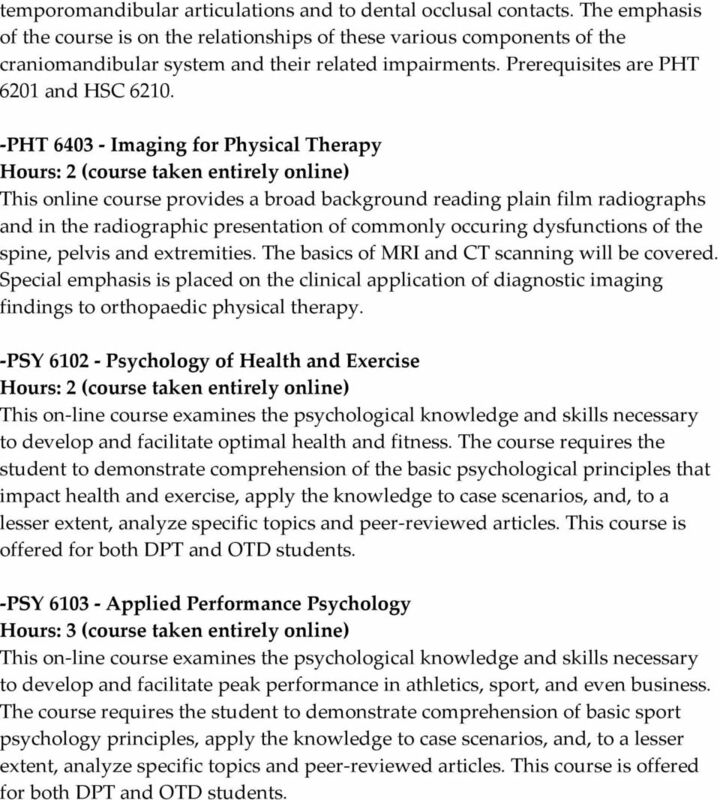 Prerequisites are PHT 6201 and HSC PHT 6403 Imaging for Physical Therapy This online course provides a broad background reading plain film radiographs and in the radiographic presentation of commonly occuring dysfunctions of the spine, pelvis and extremities. The basics of MRI and CT scanning will be covered. Special emphasis is placed on the clinical application of diagnostic imaging findings to orthopaedic physical therapy. PSY 6102 Psychology of Health and Exercise This on line course examines the psychological knowledge and skills necessary to develop and facilitate optimal health and fitness. The course requires the student to demonstrate comprehension of the basic psychological principles that impact health and exercise, apply the knowledge to case scenarios, and, to a lesser extent, analyze specific topics and peer reviewed articles. This course is offered for both DPT and OTD students. PSY 6103 Applied Performance Psychology Hours: 3 (course taken entirely online) This on line course examines the psychological knowledge and skills necessary to develop and facilitate peak performance in athletics, sport, and even business. The course requires the student to demonstrate comprehension of basic sport psychology principles, apply the knowledge to case scenarios, and, to a lesser extent, analyze specific topics and peer reviewed articles. This course is offered for both DPT and OTD students. CURRICULUM VITAE Robert M. Streb, PT, MS, PhD Education: Stony Brook University Stony Brook, NY 1/95-8/05 Ph.D. Anatomy, 2005 Long Island University Long Island, NY M.S. Physical Therapy 9/87-5/89 B.S. Real Time Ultrasound (RTUS) imaging of the stabilizing muscles of the spine and torso is now available at Marda Loop Sport Physiotherapy. Graduate Programs PHYSICAL THERAPY 203. Academic Calendar. Contact the Department of Physical Therapy for academic dates. PHYSICAL THERAPY FACULTY TOBJECTIVES. Doctor of Physical Therapy. Patricia Smith, P.T., Ph.D., N.C.S. Patricia Blau, P.T., Ph.D., N.C.
what change can I make? when can I start classes? how long will it take? where can I work?